These things will kill us, and in our daily lives we react to them. Humans, like any animal, are hardwired to survive during situations that threaten those basic needs. Take away the brattiest teenager’s iPad and stick him/her in a jungle and they will need food, water and safety. Charles Darwin said that it is not the strongest or most intelligent that survive, but instead those that are most adaptable to change. Therefore, in the case of our marooned bratty teenager sans distraction device, it is possible to either survive or die depending on that teenager’s willingness to change according to the situation. Some people might just sit there and wait for help, while others would assume no help is coming and try to satisfy the three basic needs of hunger, thirst and safety. Given 24 hours in a situation like that, reintroduce the teenager to his/her iPad and I bet that they see no importance to it if it cannot help them survive. Now THIS is what a survivor looks like. Everyone take note. Survival in video games has a very long history, with the term ‘Survival’ having many different definitions. In most games, survival is simply conservation of ammo and health. In a game, what were you willing to do in order to survive? In any Bethesda game you were most likely willing to steal things from good people and kill for reward. In most RPG’s, people are more than willing to endure unnecessary side quests in hopes of having access to new equipment. With safety being one of our key survival points, sometimes all that is required is to have the bigger stick or the thicker armor. Player skill comes into the equation as well, of course. Stephen Hawking said that it is not clear whether intelligence has any long-term survival value, but I think it is very clear that good strategy (which is usually intelligence mixed with common sense) is invaluable in any survival situation. After being in the military for a few years I tried to get into games like Call of Duty and Battlefield. I really enjoyed the single player campaigns, but to my surprise I was getting owned in the multiplayer by civilians with no training or maturity whatsoever. It was wholly frustrating, because the other players weren’t treating it like a military experience at all. Basic things like using cover and short, well-aimed bursts made the average player better but overall most people were just running around and killing each other. It was impossible to place the enemy line, pick a defensive firing position that wasn’t basically cheating and/or rally my teammates to clear areas of the map with me. Unbeknownst to me at the time, a great Military leader had some good advice for me. Anwar Sadat said “He who cannot change the very fabric of his thought will never be able to change reality, and will never, therefore, make any progress.” This was a game where my training was not useful at all. This was a situation where I COULD NOT survive using conventional tactics. Once I stopped focusing on what SHOULD work in the game and started memorizing the maps and their spawn points, cover spots and heavy traffic areas I started to do a lot better. Once I realized how most of the players reacted to different situations, I quickly learned how to get more kills. My survivability had exponentially improved. Over the past few months, one game has taken up most of my time: X-Com. This game is not perfect by any means, but it is an outstanding game regardless of its minor flaws. I think the thing that draws me back to it is the aspect of survival. If you aren’t successful in missions against the alien menace you don’t get a screen asking you to replay that mission. Instead, you have to deal with the casualties and newfound lack of confidence some nations will have in your ability to repel the extraterrestrial threat. Success doesn’t just mean you move on in the game, success means you have soldiers with combat experience and (through the support of confident nations) more money to spend on them. Each victory feels like a victory, and each defeat is a true blow dealt to the cause of humanity. The story behind the game is a little weak, but it’s all just a backdrop to the give/take, risk=reward strategy of managing an international organization of E.T. killers. It’s not very often a thinking man’s console game arrives, and we shouldn’t squander the opportunity to cherish it now that it has. What about future games? Naughty Dog’s upcoming game Last of Us looks amazing, but is it more or less a 3D Platform/Puzzle game or is there a real survival aspect to it? The complete truth will be evident next year sometime, I guess. The same goes for the new Tomb Raider game, which looks like it will be a more mature and graphics-intensive upgrade to “more of the same” gameplay we’ve come to expect from the franchise. There’s usually not a whole lot of deviation to these games, leaving a linear experience that you probably won’t play through completely more than once without some catchy, unlockable incentive. A franchise I’ve been looking forward to seeing the next installment of is The Walking Dead by TellTale. This is a game that has held nothing back, even with its limited capabilities. When you aren’t walking around finding stuff and talking to people, you pretty much survive through one of a couple mini-events that challenge your reaction time and ability to work under pressure. The thing I like most about this series so far, which comes out in sequential episodes, is that you get to make real choices. Two people are about to die, and you can only save one. The story changes based on your decision during these critical moments, and you have to act fast. The concepts of morality, loyalty and practicality are at constant odds with one another. It may not be the most difficult game to grasp and is very linear during a majority of the game when you aren’t making big decisions, but as a big fan of the comic book and TV show I have to say that the cameos of familiar characters and the idea that I can go back and change everything in a separate playthrough when the final episode comes out here pretty soon keeps me wanting more. 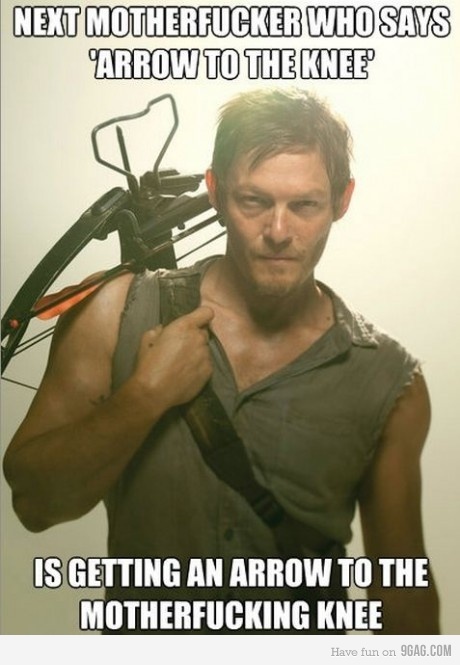 I can only hope that the Walking Dead shooter starring Daryl Dixon is more than a cash-in on one of the series’ most beloved characters.